Bangalore University is a public state university which is located in Bengaluru in the state of Karnataka, India. 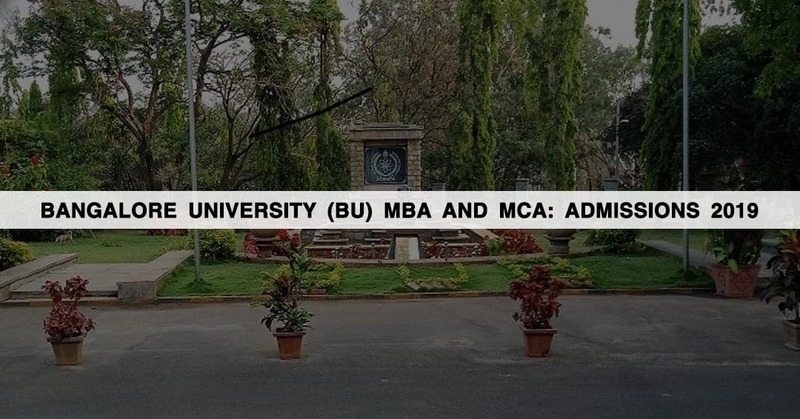 The university is a part of the Association of Indian Universities (AIU), Association of Commonwealth Universities (ACU) and affiliated by University Grants Commission (UGC). Bangalore University is accredited by NAAC under the new grading system with a grade A in 2016. The university is inviting applicants to apply for its MBA and MCA course. The candidate should have a bachelors degree with a minimum of 50% of marks with Mathematics/ Statistics/ Computer Science / Computer Programming/ Computer Applications / Business Mathematics / Business Statistics as one of the Optional or Electives at Degree level. For lateral entry of MCA, candidate who has passed recognized Bachelor’s Degree of minimum of 3 years duration examination in BCA, B. Sc (I.T. / Computer Science) with Mathematics at 10 + 2 level or at Graduate Level and obtained an aggregate minimum of 50% marks taken together in all the subjects in all the years of the Degree Examination is eligible for admission to MCA courses (45% of marks in Q. E. in case of SC, ST and Category-I of Karnataka candidates). No PartTime courses are offered for MCA. A Candidate who has passed Bachelor Degree examination with not less than 50% of marks in aggregate in all the three years of Degree examination. A Graduate Degree under 10+2+3 or 10+2+4 pattern under any discipline securing at least 50% marks in aggregate including languages from a recognized University. Honours Degree through 0+2+4 pattern from a recognized University under UGC Act having at-least 50% marks in aggregate including languages. Candidates who have passed Bachelor / Master Degree through Correspondence / Open University system from this University or from any other University recognized by law are exempted from 10+2 pattern. The duration of the Degrees must be 3 years / 2 years respectively. Candidates who pass Bachelor / Master degree in any University system in a single sitting pattern are not eligible. After graduation, a minimum of 2-year experience as full-time supervisory in any organization with a turnover of a minimum of three million and employing not less than 50 employees. However, in the case of a teacher working in the university or affiliated colleges, two years of full-time teaching experience is essential. In the case of non-teaching (full time regular) employees of Bangalore University, a minimum of 5 years experience is necessary. Enter all the details through Online by browsing URL www.kea.kar.nic.in on the web by selecting “PGCET”. After completion of all the details candidates will receive an application ID and Password to their registered email address. Upload the scanned copy of the recent passport size Colour Photo and Signature in JPEG format separately. Download and take the printout of the Challan copy which is the triplicate. Candidates of Karnataka origin have to pay an amount of INR 500/- for General / OBC & INR 250/- for SC/ST. The candidates have to pay the requisite fee in any of the branches of specified Banks. The Bank will retain its copy of the Challan and handover the remaining the two copies if the Challan to the candidates. Download and take a printout of the application form on A size paper. Affix candidate’s recent passport size photograph, Signature, Left-hand Thumb Impression on the space provided. Afterward, obtain Principal seal and signature from the college where you have studied final year degree examination on the space provided in the printed form. The same copy should be produced during document verification along with the copy of Challan (KEA Copy). Candidates need to pay an application fee of Rs.500/- for General/OBC Category and Rs.250/- for CAT-1/SC/ST through DD in favor of Finance Officer, Bangalore University, Bangalore. In accordance with Admission Rules, preference will be given to Bangalore University students with domicile. Even after filling up of these seats, if the seats are vacant, second preference will be given to the students who have graduated from Bangalore University but who are not of Karnataka domicile. © 2018 Indian Admissions Guru. All rights reserved.